The 2017 Chrysler Pacifica is the minivan to watch in 2017, and with the hybrid version, the deal is only getting sweeter for buyers! Not only is it the very first hybrid minivan on the market, but drivers will be able to go up to 33 miles on solely electric power before switching over to regular gas/electric hybrid power! The EPA gave its first award to a minivan ever-- a rating of 10 in its Green Vehicle Guide to the Pacifica Hybrid! It has available features like a dual-screen rear entertainment system, an automated parallel and perpendicular parking system, automatic emergency braking, and a built-in vacuum cleaner that has different connection points in the vehicle for ease of use. 2017 is a good year to be a minivan owner, and the Pacifica hybrid is certainly bringing valuable possibilities to the table. For the Pacifica Hybrid, Chrysler employs an augmented version of the V6 found in its gas siblings, fused with a pair of hybrid motor/generators. There is a 16-kWh floor-mounted battery pack that adds the electric power to the generators. The combined array sends power to the 'eFlite' electrically variable transmission (EVT), the sum of which is estimated at 260-hp. The EPA tested the hybrid and said it is able to range up to 33 miles on electric power only before it transfers to regular gas/electric hybrid operation and achieved an 84 MPGe estimate (566 miles of total range). Battery recharging happens naturally when braking or coasting, something currently essential to hybrids and EVs. With a 240-volt outlet supplying power (like the one for your home clothes dryer) and a Mopar charger, Chrysler states recharging a depleted battery will take only two hours. If drivers want a full recharge without that setup, there is a 120-volt connector standard in the hybrid that takes about 14 hours in EPA estimates. 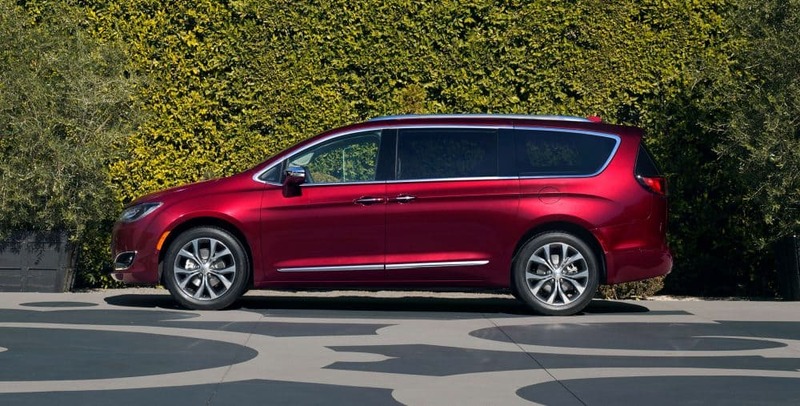 The Chrysler Pacifica hybrid minivan has Stow 'n Go (folding/collapsible second-row seats), a 5-inch center touchscreen display, three-zone climate control, 17-inch alloy wheels, heated mirrors, keyless ignition and entry, 7-passenger seating, a 60/40-split folding third-row seat, LED daytime running lights, and an 8-way power driver seat. But the list doesn't stop there! It also has an electric parking brake, a rearview camera, Bluetooth, a tilt-and-telescoping steering wheel, voice commands, and a 6-speaker sound system with USB and auxiliary jacks. The 8.4-inch Uconnect touchscreen is an option, which brings crisp and clear graphics, quick processing and an easy-to-use interface-- plus, the Uconnect Access functionality. The "Uconnect Theater" rear entertainment system is possible to obtain as well, which lets various devices (smartphones, gaming consoles) be connected and has built-in apps and games too. Uconnect Theater also plays Blu-ray discs on the dual 10-inch touchscreens mounted in the back of the front seats! 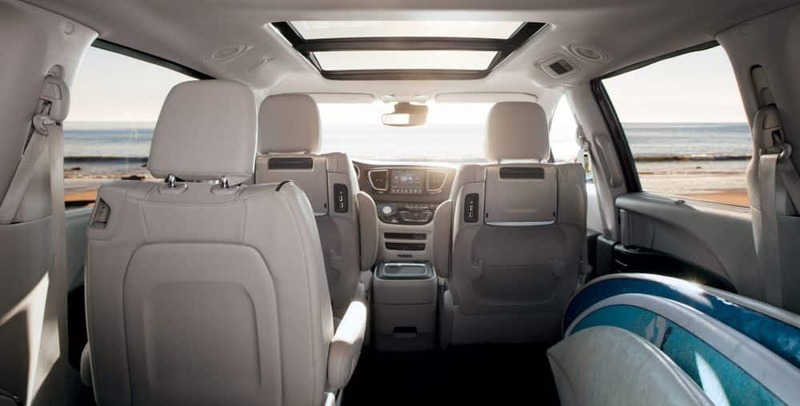 In back of the last row of seats, the Pacifica makes 32.3 cubic feet of luggage space happen. Fold those seats down to see 87.5 cubic feet appear. Maximum cargo capacity is 140.5 cubic feet, as the battery container doesn't reduce the room like is seen in other hybrids! Standard safety equipment for the 2017 Pacifica Hybrid includes traction and stability control, a rearview camera, side curtain airbags, antilock disc brakes, front seat side airbags, and driver and front passenger knee airbags. The Uconnect Access service includes remote door locking/unlocking, emergency assistance, and vehicle location services, all with subscription. Blind-spot monitoring rear parking sensors, and rear cross-traffic alert appear as well. The available Advanced SafetyTec Group package contains adaptive cruise control, automatic wipers, lane departure intervention, forward collision warning, automatic high-beam headlight control, lane departure warning, forward collision mitigation with automatic braking, a 360-degree top-down camera system and an automated parking system (both parallel and perpendicular). If you're backing up in a 2017 Pacifica, the rear parking sensors have automatic low-speed braking functionality that can be used when something is detected and the driver seems unaware. The 2017 Pacifica Hybrid is here and it is worth your time to come on over here and try one out for a electric-assisted spin!